Fermentation Culture - Canine Caviar Pet Foods Inc. Animals consuming Canine Caviar’s fermentation culture digest more of their food. Our process is unique, complicated, expensive and time consuming, but in our opinion, the finest way to make a true fermentation culture. It produces enzymes, lactic ferments and B vitamins. Each cell possesses a thick membrane through which it secretes enzymes, co-enzymes and vitamins into the surrounding media. Enzymes are vital and without them, no life could exist. Canine Caviar’s fermentation culture does not rely on living yeast to act. It is produced by pre-fermenting and gently drying to produce a nutritious ingredient, enriched and preserved with healthy metabolites. These enriched metabolites go on to improve food digestion and stabilize the animal’s natural microbiota. The enzymes in our cultures assist in the breakdown of proteins into usable amino acids. By using our fermentation culture, the animal is given the advantage of having its essential nutrients made more completely available and for a longer period during the digestive process. Unlike brewer’s yeast, which is an ethanol by-product that is severely heated and rapidly dried, Canine Caviar’s fermentation cultures are produced and dried with low-heat to avoid damaging the metabolites they produced while fermenting. Metabolites contribute to proper intestinal function, which does more than absorb nutrients. It contributes to healthier intestinal cell structure, or gut morphology, with a larger active surface area. The gut is also the body’s most active immune-supporting organ, defending against unhealthy bacteria and stimulating immune cells to fight infection. Like probiotics, Canine Caviar’s fermentation cultures stimulate the size and stability of the animal’s natural intestinal microorganisms. More microorganisms improve digestion and buffer against occasional digestive upset. Unlike live yeasts or probiotics that can’t survive extrusion, Canine Caviar’s fermentation culture is not as sensitive to heat. This is because, as stated earlier, we don’t rely on living yeast organisms for the product’s function, we rely on the metabolites they produced in their original fermentation and preserved in the culture. Canine Caviar’s fermentation culture is not “inactivated” by the heat of cooking because the stable and active metabolites remain functional. This means more nutrition with smaller stools. Canine Caviar Pet Foods, Inc.
Canine Caviar’s Probiotic Fermentation Culture is proven to be effective in normalizing digestion and decreasing stool volume. Our probiotic fermentation culture was recently included in digestibility trials conducted by an independent laboratory. Dogs were individually housed in metabolic units and ate one of two 26% protein, 16% fat diets over a 12-day period. 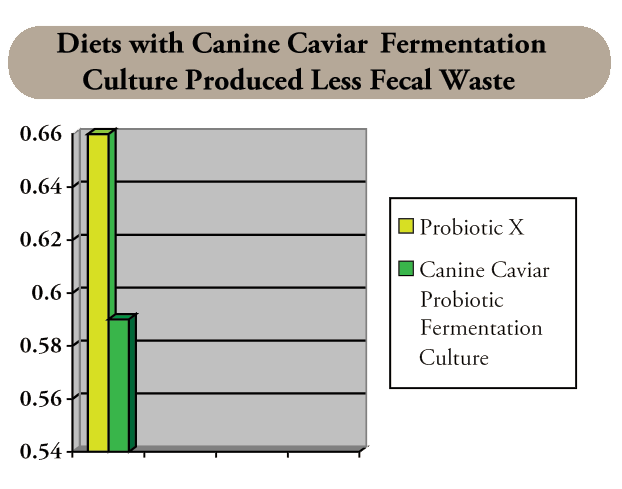 One diet contained a popular brand of probiotic, and the other contained the Canine Caviar Probiotic Fermentation Culture. While the nutrient absorption from the two diets was not different, the diet containing our probiotic fermentation culture produced notable improvements in the amount and consistency of the dog’s stools. These are improvements owners will appreciate. Dogs eating rations with our probiotic fermentation culture produced stools that were much smaller than the dogs eating food containing other probiotics. For each pound of food consumed, the Canine Caviar diets produced 0.59 lb of feces, which was 11% less than the 0.66 lb produced by the diet using other probiotics. 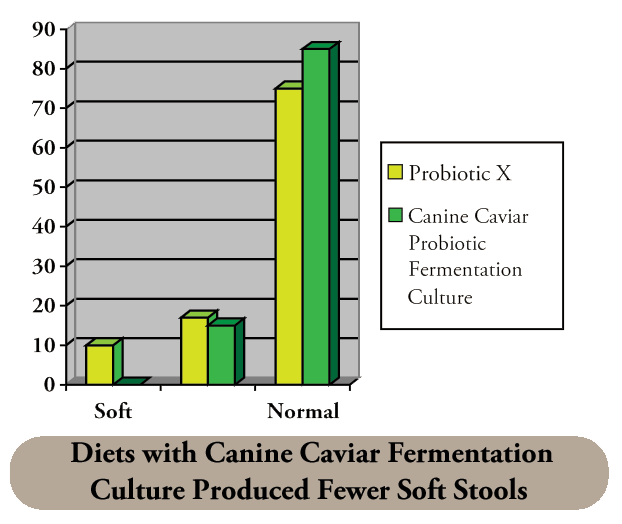 In addition to producing smaller stools, dogs consuming our probiotic fermentation culture also produced fewer soft stools and more stools with normal consistency. Over 25% of the stools from diets with other probiotics were graded softer than normal, while diets with our probiotic fermentation culture produced no soft stools and only 15% moderately soft. You already know that Canine Caviar has the taste animals prefer. You can feel confident in the way we support optimum digestion in our diets as well, a quality that owners will love even more.